There are 13 different artists featured. Most of the artists on display work in Shropshire, some are recognised and collected internationally. There is an opportunity to see the work of Anwar Jalal Shemza, an important modern artist who was born in Pakistan, and later lived and worked in the UK until he died in 1985. His work features in the collections of the Tate, MOMA in New York and many other public museums worldwide. The five pieces included in this exhibition are from the Roots series, produced around 1977. 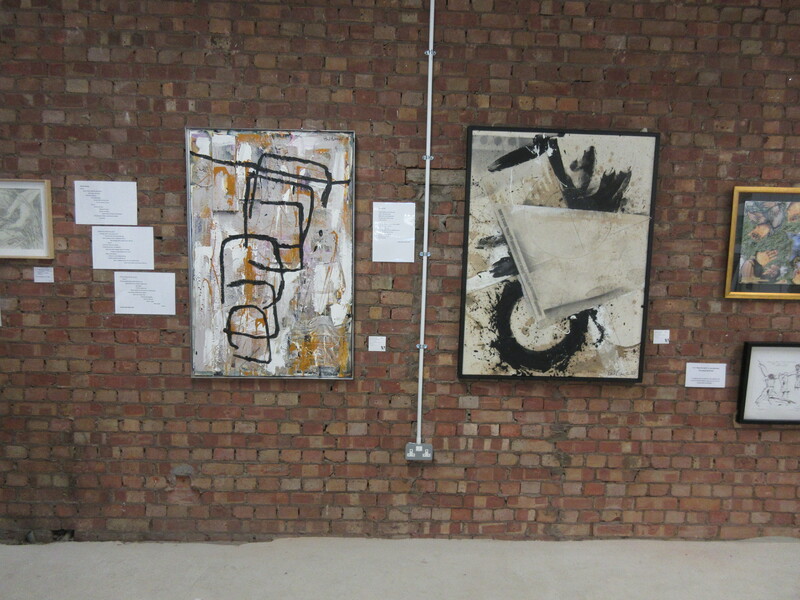 They are on loan from the private collection of a Shropshire based art collector. “As I look at the collages of Malcolm Tillis I am astonished to see such a continuous core of creativity, and such endless explosions of joyous imagination. I know of no abstract artist alive today in any country whose art is more lyrical. Despite our digital age, traditional methods of combining images and materials remain an exciting way to interpret the world visually, often creating surprising effects and new narratives. There are no rules. Peter works mainly with collage, montage and photo-montage, utilizing found objects, often paper ephemera and a range of other materials. He has recently shown an interest in Robots allied with time and space travel and has used some old OS maps as a basis for image making. He is an art Psychotherapist and has worked with young children, adolescents and families. Peter worked as an art tutor at Shrewsbury HMP helping to run an art group for vulnerable men. His work has been shown at the Talbot Rice Gallery in Glasgow, Keele University, Sheffield University, the Gateway and the Bear Steps Gallery in Shrewsbury, the Willow and Cube Galleries in Oswestry, the Chester Open and other venues. He works out of a studio based in the Participate Contemporary Gallery on Riverside Mall, Shrewsbury alongside other artists. Gretchen was born into a family of artists and musicians and has continued in that vein for most of her life. She has always loved studying nature and its individual parts as they relate to one another. She is also constantly on the lookout for different ways to express old themes and to use artistic expression as a way to comment on history as well as current events. Gretchen has been a student of Stuart Brandt and Jack Baker of Santa Barbara, California. She says her greatest teachers are her eyes as everything artistic comes from observation and the willingness to remove roadblocks from experimentation . This is her second collage exhibition as she usually works in oils, watercolours, colour pencils and pastels. Ted was born and bred in Shropshire and returned to his roots some 13 years ago after spending most of his working life in Oxford. He now lives in Wem. Influenced by the work of, amongst others, John Heartfield, Peter Kennard and Max Ernst, Ted has become more and more engaged in collage making over the last few years. 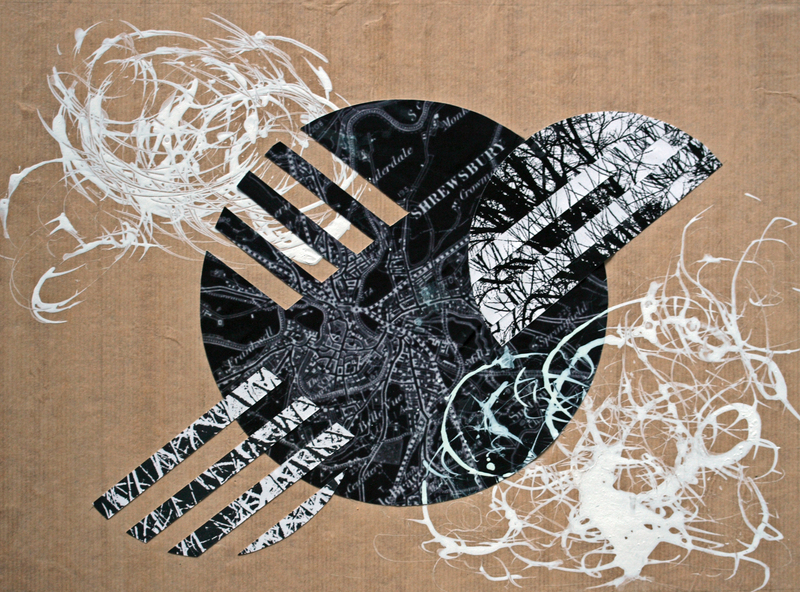 Emily is a Shrewsbury-based artist and poet working with collage, paint, poetry, writing, textiles and bookmaking. In 2014 she was artist in residence at Wenlock Books, resulting in nine month’s worth of generous funding from James Patterson’s Independent Booksellers Grants to work with children using art and poetry. Emily has exhibited in Scotland and Shropshire, and she has created installations at events such as Wenlock Poetry Festival. She has strong experience in delivering public workshops and in community engagement and regularly teaches workshops in mixed media art and words. Emily is currently working with care home residents in Herefordshire as part of the Courtyard Art Centre’s Colour Me Purple project. Rosie is an artist and teacher, graduating from Camberwell in Ceramics in the 1970s. “I have been teaching ceramics, painting and drawing, and history of art for many years at 6th Form College and in adult education. My work has been shown in exhibitions in the South East, France and the Marches. 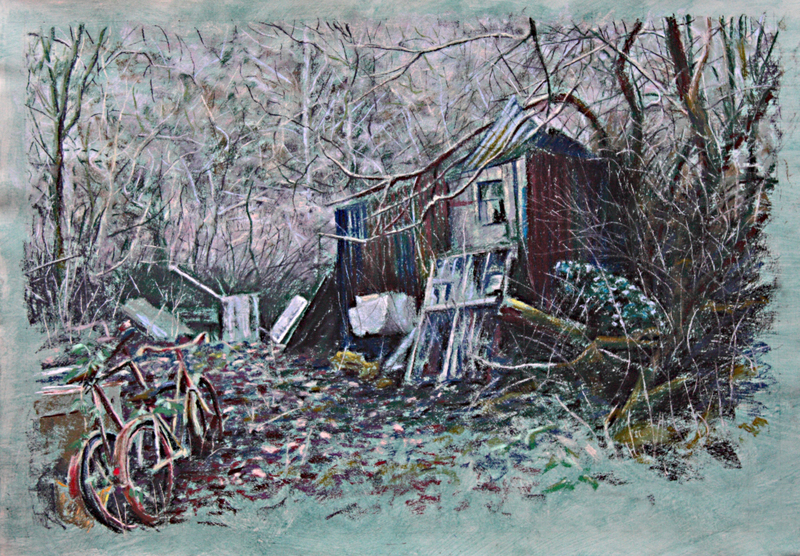 I was Chair of Castle Artists in Bishops Castle for many years, and currently a Trustee of Visual Art Network. At present, I work in my own studio in the Market Hall, making “Boats”(papier-mâché, cardboard and found objects), painting and assembling collage using layers of papers, mostly archaeological subjects and memorabilia. I also produce watercolours of local landscapes and seascapes. 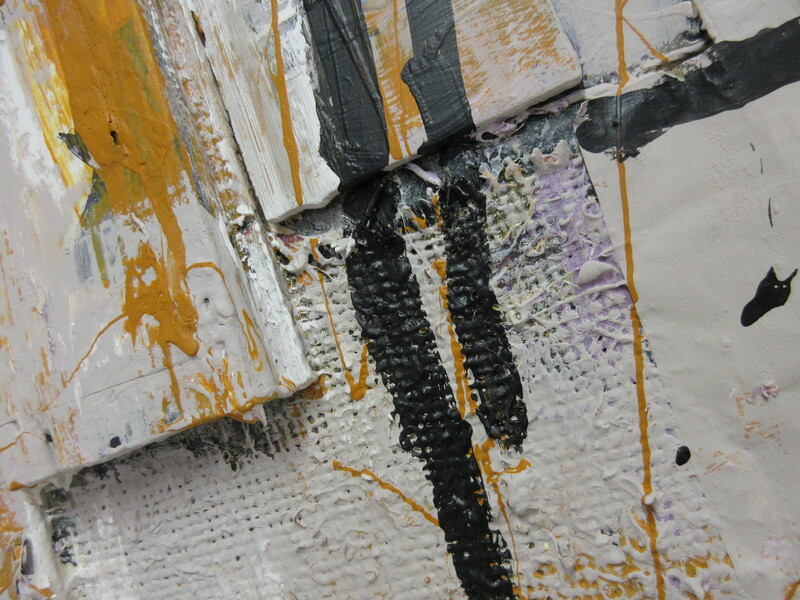 I use inks, watercolours and acrylic paint in the main and often incorporate text in my work. On a lighter note, I paint fruit and veg. Heather Prescott is a printmaker, illustrator and designer. She makes artists books because she likes to tell stories and because making books brings together all the disciplines she enjoys including collage, printmaking, drawing, watercolour, typography and design. Heather studied Graphic Design & Illustration at Camberwell, post graduate printmaking in Brighton and then gained MA (dist.) in Art & Education at University of Central England in Birmingham. Angela Martin is a cartoonist, illustrator and printmaker. She studied Textile/Fashion at Middlesex Polytechnic and later did an MA in Textile History at Winchester School of Art and retains an interest in textiles through research and lecturing. Angela has run workshops and courses alongside freelance cartoon work. Her education work has developed into coordinating community arts projects and working with a variety of people young and old. Arts projects include Sheepshape, Hatscape and Art Allotments. 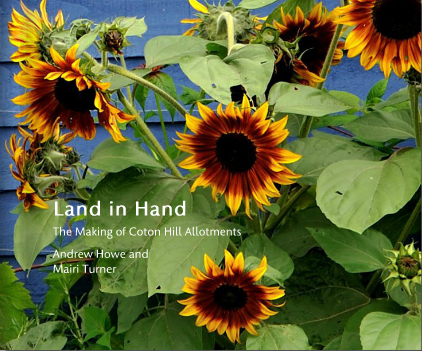 In 2009 Angela and Heather started a collage collaboration called Art Allotments which ran for a number of years. The two artists sent each other envelopes containing their rejected art work of drawings, roughs, prints & abandoned ideas together with interesting ephemera and text. 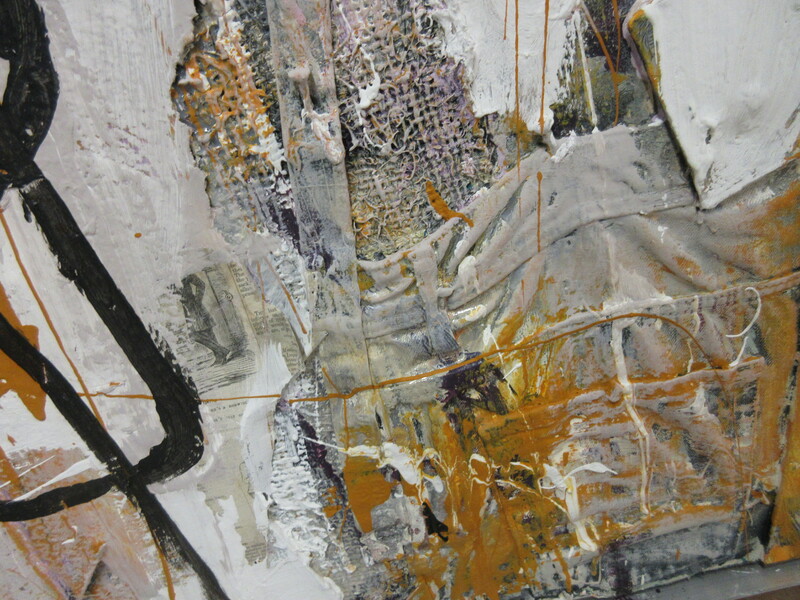 They in turn created collages quickly and intuitively using the received materials. Many visitors took part in the Art Allotments workshop led by Heather Prescott and Angela Martin, assisted by myself and Peter – making collages recycled from “artistic compost” of rejected work and other collage bits. “I have three A levels in Art and studied at Waltham Forest Adult Education Centre. I enjoy collages and abstract art and practice every week at my art group in Finchley in North London, which is supporting people with Asperger’s and Autism. After the first Shrewsbury Open Studios weekend last week, this week is busier as I took down my exhibition at the Hive today, and then must change around my studio in readiness for the second weekend of the Open Studios on 10th/11th June, whilst also preparing for installing the Collage Now show in the VAN Street Gallery on Monday 12th June. 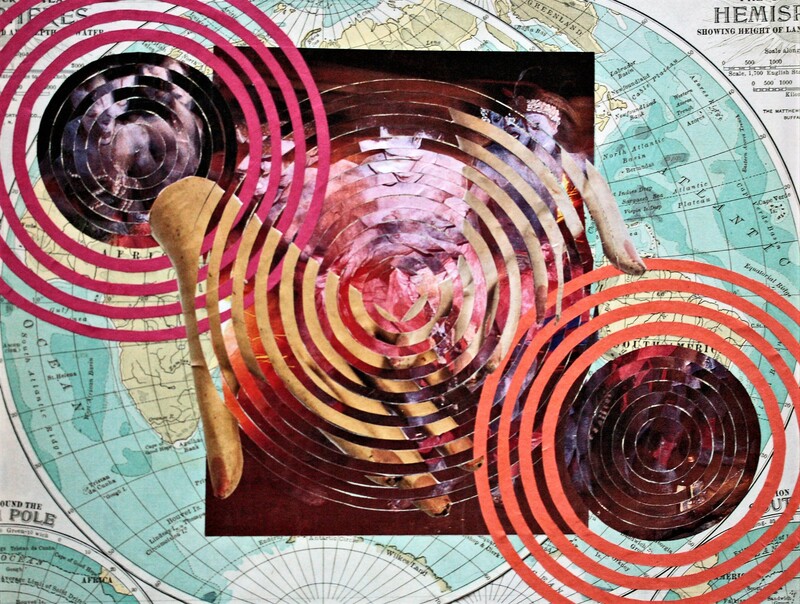 My co-curator, Peter Williams and I did an interview yesterday about the Collage exhibition on Red Shift radio with Mark Sheeky in his Artslab studio. A thoroughly enjoyable experience, and it was a real revelation to discover another layer of arts activity going on in the back of a fine old building on a rainy day in Nantwich. The interview is in about three five minute slots, starting about 20 mins into the programme. We didn’t get much chance to prepare beforehand so the interview is quite spontaneous for all three of us, and there is some interesting insight into the background to the exhibition, and our individual artist practice. But not as much as I’d liked to have said about the contemporary relevance of collage or about all of the other artists involved. Nice to have a chance to promote the exhibition to a different audience though. For now, I’ll point out that there will be a free workshop event during the day on 17th June, with a private view from 5.30pm that evening. I’ll say a bit more about the exhibition in a later post. Its six years since the last time I opened my studio to the public, and this year there are 34 artists taking part. Its a lot of work to prepare – in theory its a great opportunity to sort the studio out, which I do to an extent, but then end up shifting stuff out of sight only for it all to return when the crowds have gone. Crowds is a slight exaggeration, as visitor numbers were a bit down on previous occasions, but there are a few factors at play. The large number of artists taking part in the town centre has a impact on visitors willing to make the effort to walk an extra 5-10 mins out of town to my studio. Plus the Shrewsbury event also coincides with open studio events elsewhere at Shropshire Hills art week and Borderland Visual Arts. I’m expecting a lot more friends/family visitors next week though for an event organised by my wife, Julie. It is an anxious time, allowing potential strangers into your personal working space (and in my case, my family home). 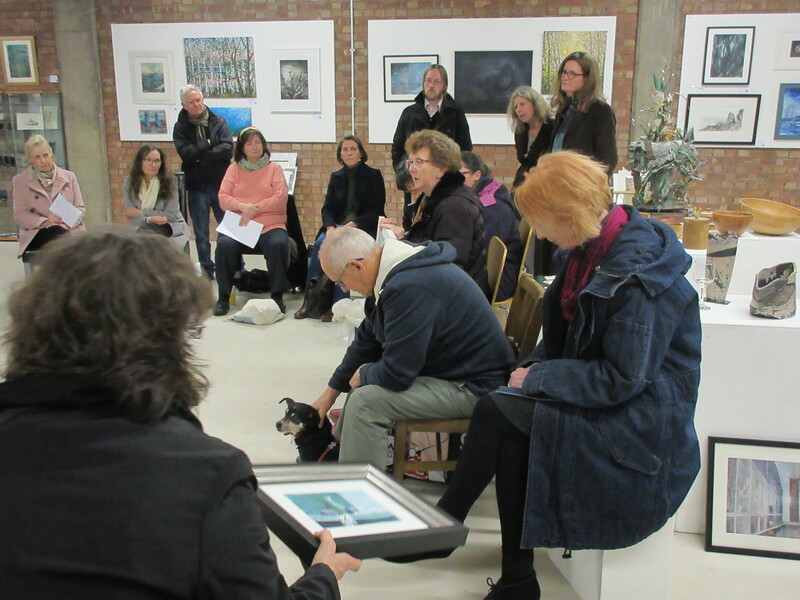 The open studio experience is quite different to the pristine gallery exhibition experience. My studio is overcrowded with art work, so some of it gets overlooked. But it isn’t a gallery, it just offers a little insight into where and how I work. The engagement with audience is more informal, and people seem to be less inhibited about asking questions and giving feedback. Its been invaluable to hear some of the reactions to my work. Come along next weekend! Open Saturday and Sunday 10th/11th June, 10am to 4pm. This year, my daughter Eliza, is also exhibiting some of her artwork including paintings, pastel and other drawings, pottery and the three books we have published. These are on display in the “Little House” in the garden. She has been thrilled to guide visitors round her show. My walking workshop event at the Hive stimulated some interesting responses. May 23rd was a a beautiful warm Summer evening in Shrewsbury, and after my brief introduction in the gallery to my exhibition and ways of working, we set out for a walk of about 30 minutes. Everyone was familiar with the town, so I wanted to try and break habitual ways of observation and remove some of the filters we employ when we walk from A to B. Using input from participants I developed a simple algorithm to guide me on route to our destination. None of us knew where we would end up, so we just had to concentrate on being in the moment, taking in the overwhelming flood of sensory experience when we limit other distractions. I walked at a brisk pace which was a frustration to some who wanted to linger and study passing views in more detail. Overall though, the algorithmic walk was a fascinating experience, and most of the attendees began noticing details they might otherwise have missed. I even walked through several locations around the town centre that I had never visited before in 20 years. We arrived at Frankwell car park between the Guildhall and River Severn. Clouds of mayflies danced in the low sunlight, a cricket match commenced in the sports field nearby, a fellow artist wandered by walking their dog, groups of kids hung about by the river – it was a relaxed atmosphere in which to gather materials to make art. Participants made sketches, tracings, rubbings, photographs and recorded experiences in text. On our return to the Hive, and after some refreshment, we began making small collage/installations using some of the gathered materials. We worked quickly and spontaneously to work with instinctive ideas. I was impressed with what could be created in a short space of time. It was interesting to see how our collective experiences of the place overlapped and contrasted, how unique visual maps had been generated by each person.